Applicants must be current undergraduate students enrolled in the College of Engineering at UCSB in good academic standing. Criteria for awards include: major, grade point average, academic achievements, research projects, and in some cases, extracurricular activities. The application cycle will open November 1 and will close at 4pm on Monday, November 26. The application forms will be available at: https://apps.engineering.ucsb.edu/scholarship/. The College of Engineering Scholarship Committee reviews the applications and makes decisions during the month of December or early January. Letters will be mailed to all award recipients to their local mailing address at the beginning of Winter Quarter. Awards will be made via the BARC system and will be posted on student accounts within two-three weeks of notification. Our office occasionally gets information about other scholarships from outside agencies. Applications are submitted directly to them, following their specific instructions. We maintain a binder with all the information we receive on these scholarships. Stop by our office to get more information. 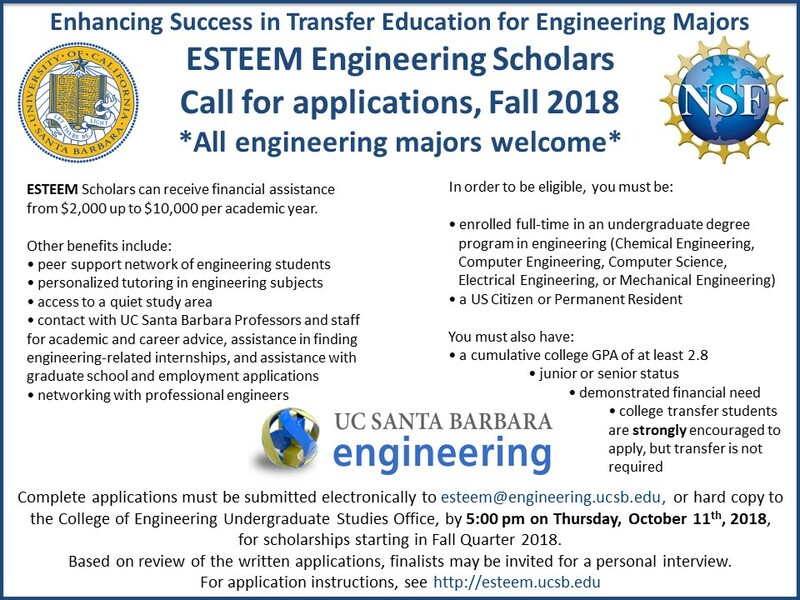 ESTEEM: Enhancing Success in Transfer Education for Engineering Majors is a scholarship and support program for academically-talented, low-income students majoring in or intending to major in Engineering. ESTEEM grants scholarships each year for students enrolled at one of the five participating California Community College institutions. View the Fall 2018 call for applications. For details and complete information, visit esteem.ucsb.edu. Financial Aid, including loans, grants, and work-study, is administered by the Office of Financial Aid. In order to be considered for Financial Aid, students must submit a FAFSA online each year. The FAFSA priority deadline is March 2nd. Tuition for undergraduate students in the College of Engineering is the same as that of other UC Santa Barbara undergraduates, for both in-state and non-California residents. To calculate tuition and cost of attendance, visit Finaid.ucsb.edu/cost-of-attendance.